A bright smile and closed eyes greeted my great grandmother when she took this photo on her son’s second birthday. She no doubt wanted a photograph to help remember his big day, but anything taken indoors probably wouldn’t have developed properly. Thus, it was time to bundle up and take little Charles outside for the shot. The more I look at this collection of photos, the more I love the idea of her carrying her camera around, capturing all sorts of images of her son. Charles James Lowry (1924-2007), photograph, taken at unknown location, in November 1926; digital image, photocopy of original, scanned in 2013 by Joseph Lowry; privately held by Mary McCaffrey, [address for private use], Canton, Ohio. 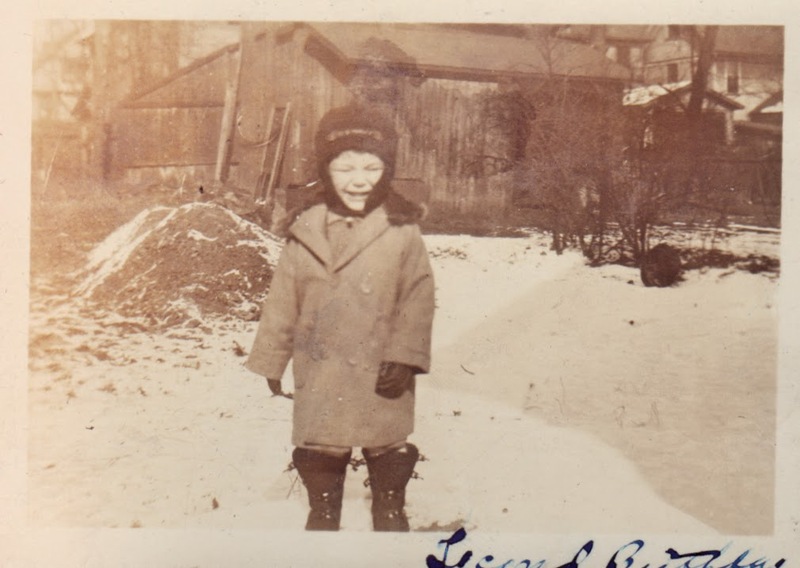 Portrait of toddler in winter coat and hat standing in snowy yard. Provenance is Charles Lowry to Mary McCaffrey.